Key Laboratory of Dairy Biotechnology and Engineering (Inner Mongolia Agricultural University), Ministry of Education is developed from its predecessor -“The Inner Mongolia Dairy Research and Training Center” . The key lab was recognized by Ministry of Education of P.R. China on November 26th, 2005. Key Laboratory of Dairy Biotechnology and Engineering (Ministry of Education) is mainly researched on “Lactic Acid Bacteria and Fermented Dairy Products”. The key lab has 3500 m2 laboratory and a 1200 m2 pilot plant. The total value of the instruments and equipments amounts to 40 million CNY. The researching group has 19 members, including 4 professors, 4 vice professors and 10 doctors. The research group is funded by the “Program for Innovative Research Team in University of Ministry of Education of China”(IRT0967) in 2009, “Prairie Excellence Specialist Innovative Research Team” in 2010, “Developing Plan of Innovative Research Team of Inner Mongolia Universities” in 2011 (NMGIRT1102), and “Leading Talents and Innovative Research team of Inner Mongolia Agricultural University” in 2010 (NDTD2010-2). 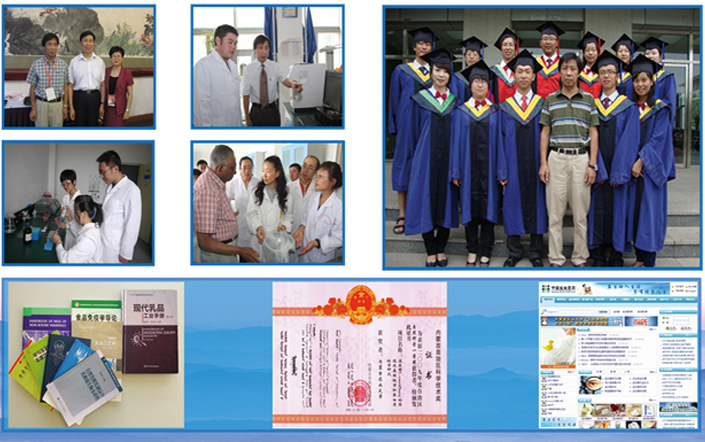 Now, our group is funded by 22 national and provincial projects, the total amount is more than 20 million CNY. 1. Published 21 books and more than 320 papers in the abroad and national journals, including 79 SCI papers. 2. Applied 32 patents, granted 20 patents. 4. Screened out twenty one yogurt bacteria used for different fermented dairy products and constructed the related screening platform. 5. Explained the inherit background and metabolism pathways of probiotic L.casei Zhang by genomics, proteomics and transcriptomics research, obtained the whole genome sequence of six LAB strains with industrial application perspective.